With standout releases in the last year from Mary Halvorson, Katharina Weber, Marilyn Crispell, Ingrid Laubrock, Irène Schweizer, and Sarah Buechi, Zurich’s Intakt Records has been doing the good and necessary work of highlighting female artists—not only well-established but also up-and-coming—in a historically male-dominated field (yes, despite notable exceptions and a general openness to all comers). 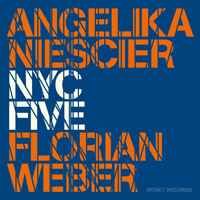 The label builds on this precedent in early 2016 with NYC Five, from Cologne-based co-leaders Angelika Niescier and Florian Weber. Here the saxophonist and pianist (respectively) draw on New York’s deep well of cultural significance and jazz talent, recruiting trumpet player Ralph Alessi, bassist Chris Tordini, and drummer Tyshawn Sorey for an hour of intelligent and gripping music. with Sorey marking out a steady 7/4 quarter note pulse around which the others weave and jab. In contrast with the tune’s robust three-part head, Weber’s solo—full of tense hesitations—is wonderfully disarming. Taking the hand-off from her co-leader, Niescier’s tightly coiled phrases and upper-register explorations work with rather than against Sorey’s rhythmic simmer to escalate the track’s intensity. After an impressive turn by Alessi, Sorey himself—obviously a special drummer, in my estimation—steps forward for a climactic solo over a stuttering ostinato by the band. The quintet excels at this kind of rhythmic complexity—mastering difficult material and making the these compositions feel comfortably worn in without losing their heat. Follow-up “And Over” is another good example, with Niescier and Alessi setting out a jaunty 5/4 phrase that suddenly shifts feel and color with the entrance of the rhythm section. Here the work of the first track is cleverly undone as the solos progressively thin and decelerate, this time towards and not away from Weber’s meditative playing. And if well maneuvered, maddeningly technical compositions themselves have lost some of their excitement, the group finds other ways to subvert expectations—for instance “The Liquid Stone,” during whose theme Niescier does no more than provide a busy, buzzing texture for simple punctuation by trumpet, piano, and bass. On the mellower end of the spectrum, the quintet knows how to play ballads, too. “Invaded” gives Weber’s spacious, patient playing plenty of room first to breathe and then to grow as his lines build in density, inverting the contrasts of the earlier, more hectic tracks. 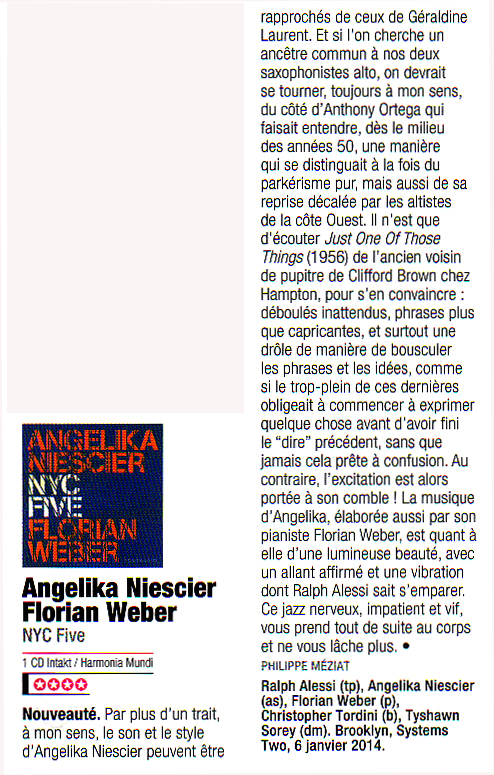 Niescier demonstrates her range here as well with an airier, gentler approach. “Parsifal” highlights some of Alessi’s gorgeously spare and introspective playing. And Tordini gets a solo, too, very welcome but brief and cautious enough to make us wish the album did more to feature him. Perhaps unfortunately for reviewers—though not for listeners!—at the end of the day NYC Five isn’t about aesthetic experiments or novel concepts but, unpretentious as the album title, the music itself: good writing and even better playing. 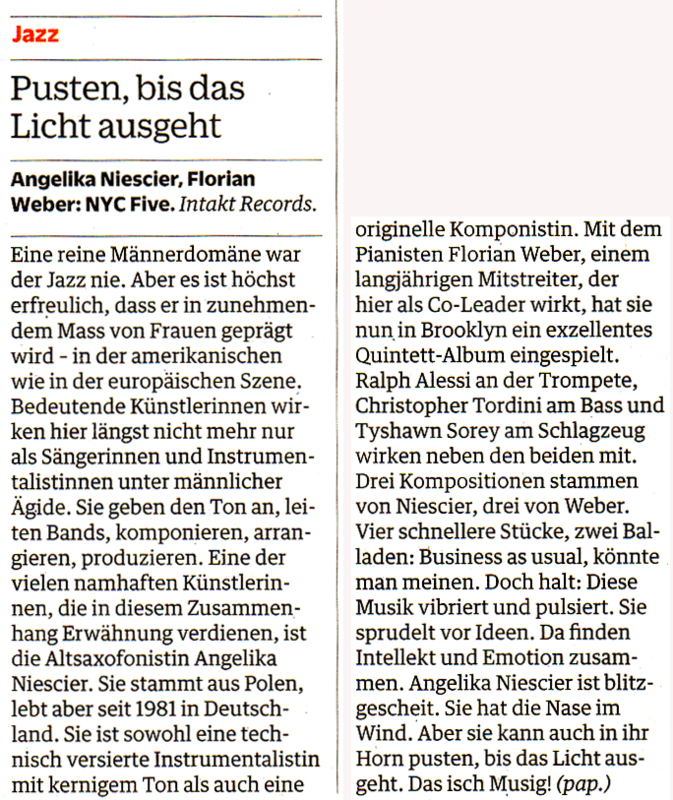 Fast klassisch könnte man den Jazz nennen, den die Saxofonistin Angelika Niescier und der Pianist Florian Weber mit ihren New Yorker Kollegen Christopher Tordini, Tyshawn Sorey und vor allem dem großen Ralph Alessi hier eingespielt haben. Eric Dolphy kommt einem in den Sinn, ja sogar Thelonious Monk, keine wirklich üblen Referenzen. Je drei Stücke haben Weber und Niescier beigesteuert, immer sehr fein abgezirkelte, gut ausgetüftelte Nummern. Sie geben guten Halt und eine klare Struktur, aber dennoch genug Freiraum für die ausgefuchsten Improvisatoren. Verzwickte Metren und deren souveräne Beherrschung sorgen für Druck und Spannung. Nicht gerade das Innovativste am Markt, aber sehr ansprechende Klänge aus der Welthauptstadt des Jazz. Saksofonisten Angelika Niescier og pianisten Florian Weber kommer begge fra Köln, og begge har de senere årene levert flere sterke plate- og konserter. På deres nyeste samarbeid på Intakt, har de palssert seg selv midt i jazzscenen i New York City. Innspillingen er gjort i System Two, i Brooklyn, og med seg på innspillingen har de hentet tre musikere fra nabolaget, trompeteren Ralph Alessi, bassisten Christopher Tordini og trommeslageren Tyshawn Sorey, noen av de mest aktive musikerne innenfor den nye Brooklyn-bølgen i dag. Niescier har jeg hørt flere ganger tidligere, bl.a. på Winterjazz i Köln. Hun har de senere årene gjort flere spenstige plateinnspillinger, og hun har gjort konserter med bl.a. 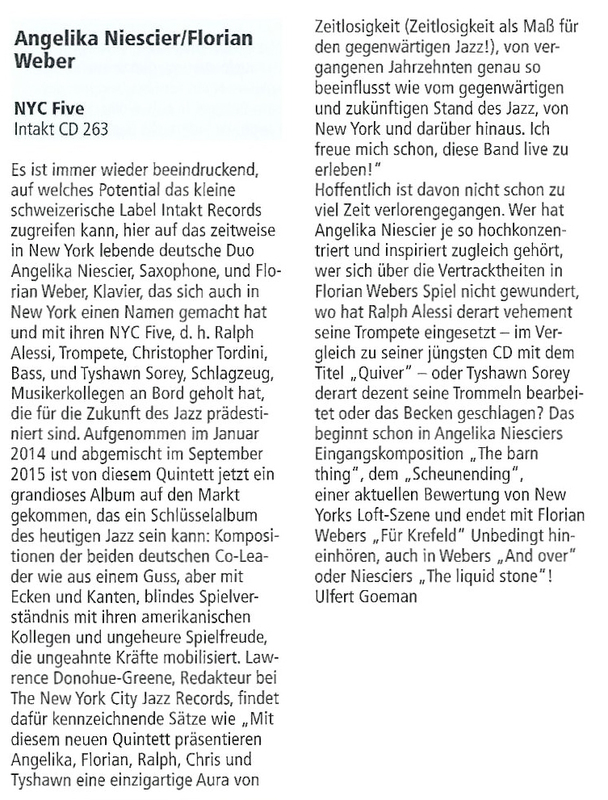 Joachim Kühn, Leia Genc, Tyshawn Sorey, Thomas Morgan, Gerd Dudek og PETER Herbert for å nevne noen. Weber har studert piano, først klassisk og så jazz, med musikere som John Taylor, JoAnne Brackeen og Paul Bley, og etter at han vant Steinway & Son-prisen under Montreaux-festivalen i 2001, har han spilt nærmest overalt. Nå møter de to tyskerne, den virkelige eliten i Brooklyn, medbringende tre komposisjoner hver. Det starter med Niesciers «The Barn King», en relativt rask sak hvor hun selv og Alessi får kjørt seg. Det er blitt en tøff og tett låt, hvor de to blåserne ligger svært tett over et lett og fint pianospill, før det åpner seg opp og vi får strålende solier fra Weber, Niescier og Alessi, og en bedre introduksjon til denne plate kunne man knapt fått. Den perfekte førsterunde! Andresporet «And Over» står Weber ansvarlig for, og vi får en litt annen stemning over det hele. Det er tydelig at her er det det kvinnelige innslaget som står for trøkket i komposisjonene, uten at «And Over» ikke sparker nok fra. Det er en mer kompleks komposisjon enn åpningssporet, og det er tydelig at her er det pianisten som styrer. Og han styrer skuta med den største overbevisning. I solopartiene tas det hele litt ned, noe som gir solistene både tid og ro til å utvikle fine solier. Spesielt synes jeg Niesciers solo her er interessant. Hun har en fin tone i altsaksofonen, og hun er et overflødighetshorn når det gjelder detaljer. Og for trompetere så er det bare å studere Alessis solo på denne låta. Han bygger det nydelig opp, og hans tone er fin. Florian Webers solo her er også et mesterverk. Webers «Invaded» er neste, og vi får en fin ballade som nesten stopper opp, men hvor Weber har den fulle og hele kontrollen over tingenes tilstand. Han er en kreativ pianist, som utnytter pianoets finesser på en utsøkt måte. Niesciers «The Liquid Stone» starter som en tour de force for altsaksofon med et fint tema som ligger under. Deretter følger Weber opp på samme måte som Niescier og det hele utvikler seg til en strålende låt. Tyshawn Sorey og Christopher Tordini ligger bak med total oversikt, og pusher de andre framover. Coolt! Så følger Niesciers «Parsifal», hennes balladebidrag, en forsiktig og melankolsk sak hvor alle musikerne lister seg stille på tå. Så avslutter de med Webers «Für Krefeld», en komplekt og rask 60-tallslåt som fungerer perfekt som avslutning, og som på mange måter knytter det hele sammen til en helhet. Det er vært å nevne at Köln er en av de byene i Tyskland som setter mest pris på sine jazzmusikere. I motsetning til i for eksempel Berlin, så får man faktisk betalt for å spille på klubbene, og siden byen er utstyrt med de to utmerkede klubbene, Stadtgarten og Die Loft, så vokser det frem dyktige musikere i byen, noe man her ser et utmerket resultat på. En strålende plate i beste moderne akustiske tradisjon, som jeg kommer til å spille mye, helt til naboene går lei og legger inn en skriftlig klage. Featuring Angelika Niescier on alto sax, Florian Weber on piano, Ralph Alessi on trumpet, Chris Tordini on bass and Tyshawn Sorey on drums. Except for one quartet disc with Denman Maroney, James Ilgenfritz and Andrew Drury from not too long ago, I hadn't heard of with Ms. Niescier or Mr. Weber before this disc arrived. All six songs were written by either Ms. Niescier or Ms. Weber. Right from the opening, we know we are in for something special here. "The Barn Thing" is quick, twisted, tight and no doubt hard to navigate easily. The interplay between the sax, piano and rhythm team is extraordinary, never missing a twist or turn. In a way, I am reminded of an early Braxton quartet piece with several hairpin turns. Ms. Niescier even sounds a bit like Braxton at times when she solos. Each piece provides a different challenge as far as the construction and ever-shifting arrangements, sort of mini-suites. No easy feat and all consistently engaging. When the quartet slows down for a ballad called "Invaded", Ms. Niescier plays an exquisite solo. tasty and reflective. Ms. Weber takes an amazing piano solo on "The Liquid Stone", a difficult shape-shifting piece with both horns tightly entwined, the solo by Ralph Alessi also amazing! Throughout this disc, the rhythm team of Chris Tordini (in several bands with Chris Speed) and Tyshawn Sorey (ubiquitous drummer for nearly everyone), prove to be one of finest tag teams on the planet. Since this disc works on so many levels and remains engaging throughout, it could very well be the disc of the year - it is that great! A couple weeks ago I was in Germany, and the end of my trip included a visit to the Moers Festival, whose reputation had been impressed upon me long ago by a series of superb live recordings made at the event (and released by its label) in the late 70s and early 80s by the likes of Fred Anderson, Philip Wilson, John Carter, Anthony Braxton, Phalanx, and Wadada Leo Smith. These days the fest isn't as thoroughly devoted to free jazz as it was when it began in 1972, but in general it does present adventurous sounds. A few years ago Moers built a permanent festival hall, which eliminated the annual expense of constructing a massive tent on the grounds, and most of the concerts are there. But one of the best things I saw during my two days happened in a nearby school as part of the event's Morning Sessions series, each of which was an ad hoc grouping intended to be a surprise to the audience. 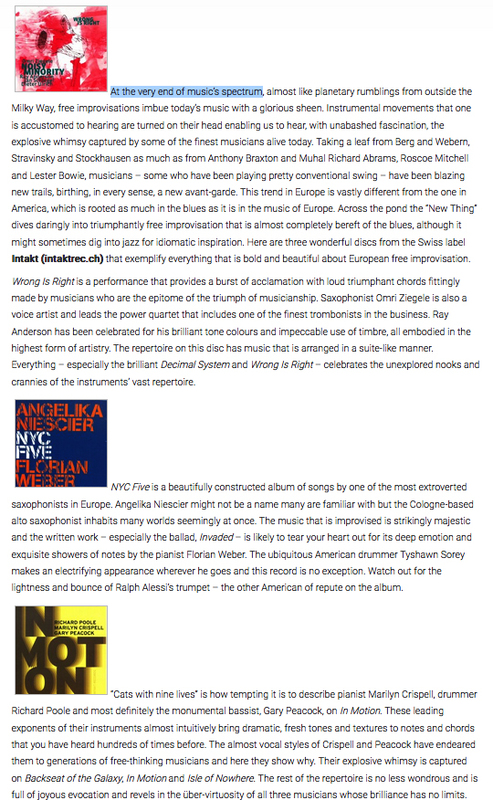 I've been a fan of Cologne-based Polish saxophonist Angelika Niescier for quite a few years, and my admiration was cemented when she played at the Chicago Cultural Center as part of European Jazz Meets Chicago in 2012. At Moers she was partnered with bassist Yasser Morejon Pino and drummer Ruy Adrian López-Nussa, who also serve as the deft rhythm section for explosive Cuban pianist Harold López-Nussa. That pianist is a fiery performer, and together their playing bursts with high-energy pyrotechnics. With Niescier they were cooler, trusting in their rapport and focusing on a subtler but no less rewarding approach. 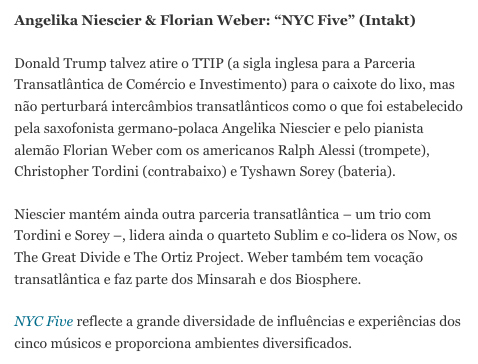 Niescier evoked the disparate sounds of two alto greats—the bright melodies of Ornette Coleman and the airy bounce and rhythmic grace of Lee Konitz—and the trio's entirely improvised performance traversed lots of peaks and valleys, fueled by deep, organic grooves. 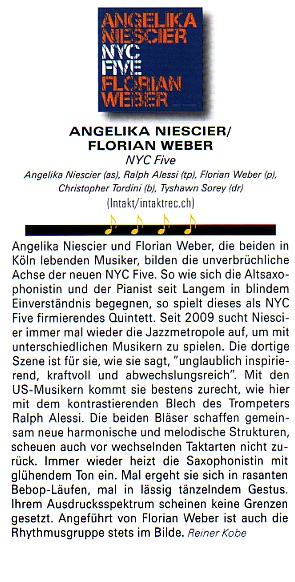 Earlier this year Niescier released a fantastic album with German pianist Florian Weber called NYC Five (Intakt), titled thusly because it was made in New York with drummer Tyshawn Sorey, trumpeter Ralph Alessi, and bassist Chris Tordini. 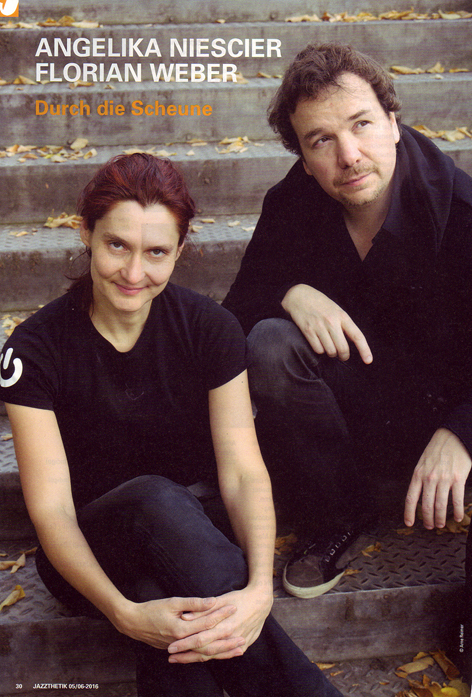 Both of the Germans have worked in New York often, and the saxophonist's previous studio album, 2011's Quite Simply (Enja), was made with Sorey and bassist Tomas Morgan—as a result, this doesn't feel like a pickup session, where visiting musicians hire a top-flight band to burnish their own reputations but end up generating few creative sparks. 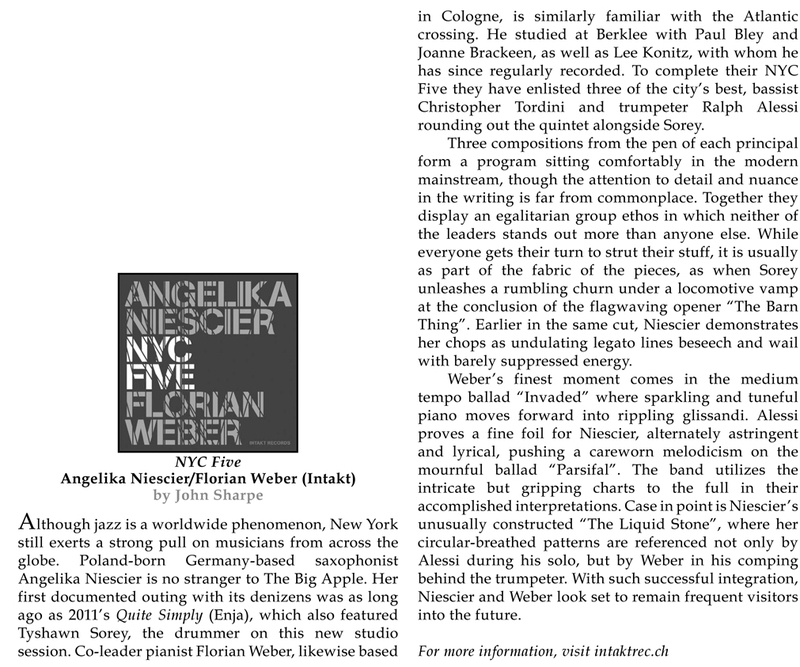 Each of the leaders wrote half of the six tunes, and Niescier brings an aggressive, driving vibe, while Weber generally opts for a more contemplative feel. Below you can hear the album's opening cut, Niescier's "The Barn Thing," a tightly coiled burner that constantly seems on the verge of exploding but instead stays reined in throughout its series of concise solos stoked by Sorey and Tordini. 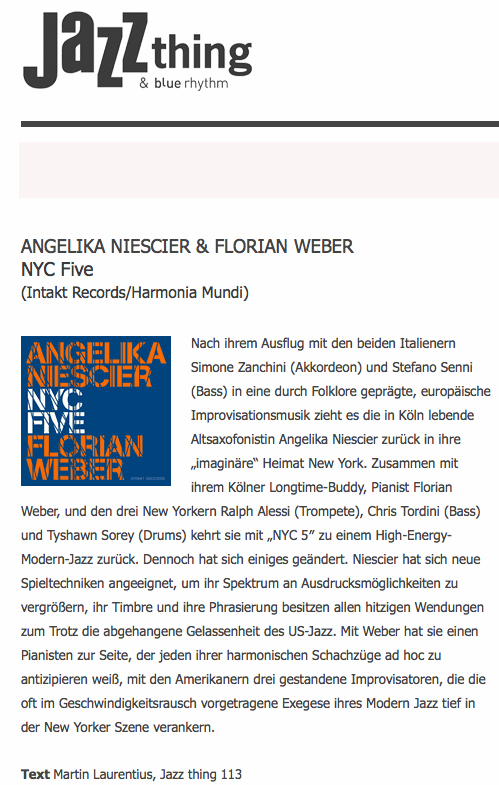 Angelika Niescier und Florian Weber, inspiriert von den Vibes dieser einen Stadt, wollten deren unterschiedliche Gefühle und Musikstile einfangen, und so entstanden 2014 die Aufnahmen zu der neuen CD "NYC FIVE" in eben dieser einen Stadt, New York City. 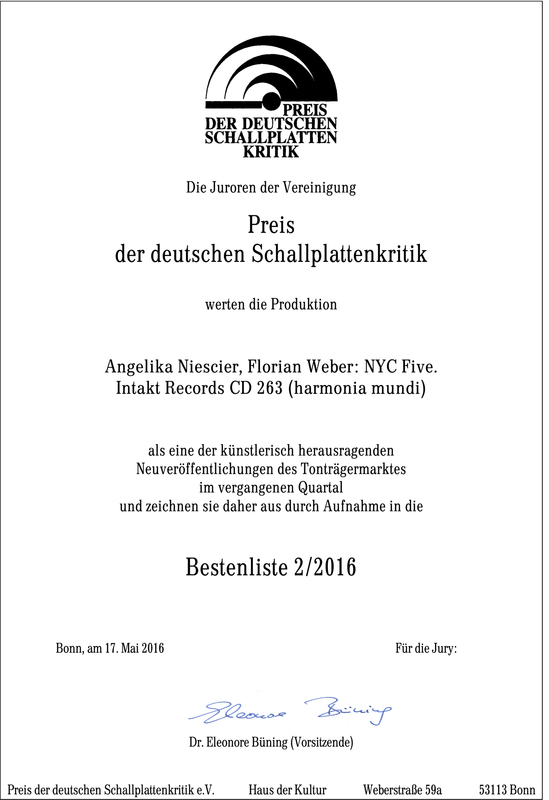 Die bereits zwölfte CD von Angelika Niesvier hat dieses Jahr bereits den Preis der deutschen Schallplattenkritik für die Kategorie "Jazz" bekommen. Ursprünglich stammt die von der Presse als "Ausnahme-Künstlerin" gehandelte Saxophonistin aus Polen. Studiert hat sie an der Folkwanghochschule in Essen und mit Diplom im Hauptfach Jazz-Saxophon abgeschlossen, in den Nebenfächern Klavier, Bassklarinette, Flöte und Komposition belegt. 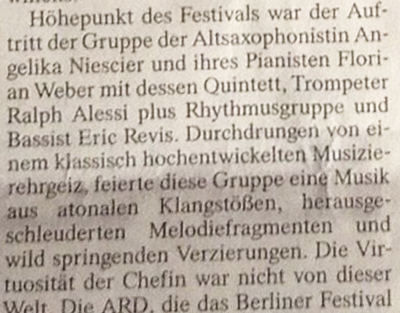 Ihre Vita liest sich wie eine Aufzählung von Jazzpreisen und Stipendien, darunter auch 2010 der "Jazz Echo". Sie ist auf allen Bühnen der Welt unterwegs, nicht nur mit ihren eigenen Projekten, sondern auch als Komponistin für Theater, BigBand, Ballett und Sinfonieorchester. 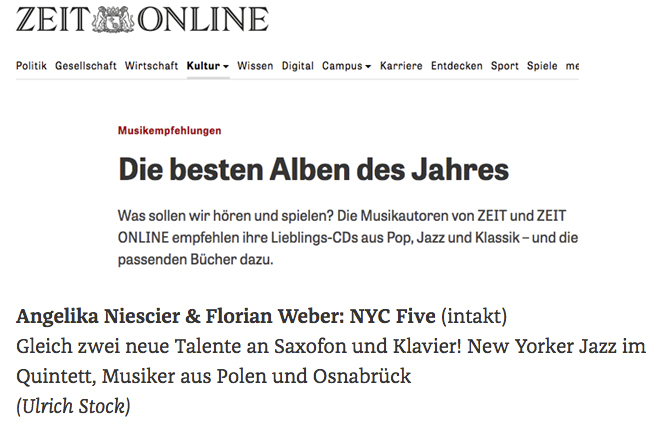 Der Lebenslauf des Pianisten Florian Weber liest sich nicht weniger interessant, er hat am Berklee College in Boston studiert und wurde ebenfalls bereits mit einem "Jazz Echo" ausgezeichnet. Als zweites Melodieinstrument ist der New Yorker Trompeter Ralph Alessi dabei, der seit Jahren eine feste Größe nicht nur in der New Yorker Jazz Szene ist. Der Drummer Tyshawn Sorey und Christopher Tordini am Bass komplettieren das Quintett. Mit Niescier`s Lieblingstitel und der Eigenkomposition "The Barn Thing" startet diese CD. Nach der Vorstellung des Themas folgen gleich rasante und virtuose Soli aller ProtagonistInnen, die damit auch zeigen, auf welch hohem Niveau sie sich bewegen. Den Gegenpol hierzu bilden Balladen wie "Parsifal"; hier ließ sich Niescier durch die gleichnamige Oper von Richard Wagner inspirieren. Zu Beginn dominiert Alessi das Stück, der mit seiner Trompete eine raue und düstere Stimmung erzeugt. In die taucht Weber mit seinem Spiel ein und beide versinken förmlich darin. Über Niescier kann man im Booklet lesen, dass sie bei den Aufnahmen so fasziniert vom Zusammenspiel der Beiden war, dass sie beim Zuhören beinahe ihren Einsatz vergessen hätte. Mein Fazit: Eine spannende Platte mit großartigen InterpretInnen, abwechslungsreich und voll gepackt mit hochwertiger Musik. Se a volte queste collaborazioni servono più che altro a far curriculum, in questo caso non è proprio così: le personalità di Niescier e Weber si affermano con disinvoltura e assorbono con saggezza il valore aggiunto degli americani. I quali condividono il piano dell'opera e fanno gioco di squadra in relax. La musica è varia e ben costruita ed esplora un percorso che può partire dall'attitudine aperta e ritmicamente fragrante di "The Barn Thing," che guarda alla spavalderia del secondo quintetto di Miles e arriva ai virtuosismi metrici di uno Steve Coleman, autore ben presente come riferimento in tutto l'album. Dunque una jazz frammentato e squisitamente metropolitano, che sintetizza le lingue dell'oggi senza mai perdere il contatto con la grammatica della storia. E accanto alle tracce angolose e dalla velocità contagiosa, si distendono anche brani dal più ampio respiro, come la splendida "Invaded": costruita come ballad, si apre poi in diverse sezioni armoniche, con Weber che sente l'ombra di Hancock, il basso di Tordini influente e narrativo, oltre a un Sorey al solito implacabile dispensatore di finezze, stavolta con le spazzole. Proprio il batterista garantisce al fluire della musica una quadratura costante e regala sfumature deliziose, mostrando ancora una volta quale sia la sua flessibilità. Angelika Niescier suona il contralto con una padronanza ferrea, usa armi affilate ma le bilancia con parsimonia e sa essere carezzevole; Weber è pianista-regista, mentre le sortite di Ralph Alessi non hanno bisogno di commenti, essendo sempre discrete e al totale servizio del sound d'assieme. On se ballade paisible, les allées rythmées de 4/4, un air de do majeur et de la mineur, passent les passants, électro rock, pop acidulée, folk jazzy, et on s'accoutume. Puis on trébuche sur un vieux grabat presque invisible. Un tas, c'est à peine une chose. Plein de poussière. Tiens donc, c'est le jazz. On l'avait dit mort, pourtant... Ah l'histoire ancienne ! D'humeur bucolique et réactionnaire par instinct, je n'avais d'autre choix que de sursauter sur la petite pépite sortie par Intakt, label helvète pourtant plus ''musiques improvisées'' que jazz jazz - à différencier du jazz pas jazz : voir le premier paragraphe et ses relents d'orthodoxie. 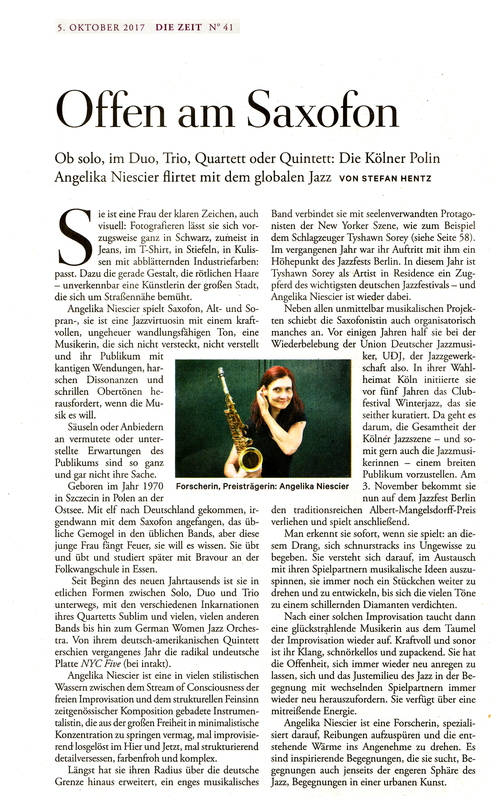 Angelika Niescier est une saxophoniste teutono-polonaise qui n'a guère traversé le Rhin, mais rien n'est plus borné sans doute par les frontières étatiques que les curiosités culturelles. De ce point de vue, Niescier fait croire une nouvelle fois qu'il y aurait du bon à faire sauter ces verrous, d'autant plus qu'on le fait sans sourciller pour les 33 tonnes emplis de cornichons. La saxophoniste, épaulée par le pianiste Florian Weber, s'entoure de New-Yorkais animant la scène free (en gros) locale, et dont la renommée n'a pas non plus traversé les mers, excepté peut-être pour Ralph Alessi, la belle trompette. D'où le titre de NYC Five, on ne peut plus descriptif, et d'où un très bel album qui se plonge dans une esthétique empruntant beaucoup à l'avant-garde des années 60 où brille notamment Tyshawn Sorey, batteur génial qui a déjà commis quelques kiffs prestigieux (Braxton et plein d'autres de l'AACM, Steve Coleman, Dave Douglas, du bon). Il suffit, sur le biographique : on aura compris que c'est du bon quoique trop méconnu. Mais c'est le propre du jazz, et c'est donc de jazz, bien vivant, dont il s'agit. NYC Five s'ébroue sur un ''The barn thing'' (le truc de la grange, sérieux?) qui donne le ton de l'album : thèmes à la simplicité hallucinée et souvent magique, lignes de basse gracieusant le groove, soli très free belle époque (de Sidney Bechet à Dolphy, si on me demande) d'Angelika Niescier. Les titres s'étalent longuement dans cette structure qui décidément n'a pas fini de dire tout ce qu'elle avait à raconter, enchaînent ballades (''Invaded'', ''Parsifal'') et tempo plus enlevé pour un album équilibré et fort bien produit, qui sublime une musique qui n'a jamais su se résoudre à devenir classique, quoiqu'on aime la dire morte. Certaines tensions vers plus d'écriture, plus d'espaces harmoniques ouvre l'album vers des horizons plus contemporains, ciselés également par des musiciens vraiment exceptionnels : beau solo de basse lyrique de Christopher Tordini sur ''Parsifal'', un Ralph Alessi magnifique tout du long, pleins de trouvailles dans l'écriture comme dans la sonorité collective du quintet. Alors quoi ? Un très bel album de jazz, ce qui n'empêche pas d'écouter autre chose. Ne soyons pas trop borné, même si c'est bon. Mais qui permet de méditer sur les discours qui font de l'électro-pop-folk-jazzy-variét le sens du vent, et des amateurs de ternaire et de note bleue des claque-patins d'un autre temps. Une fois cela médité, on pourra juste profiter de ce beau NYC Five, et c'est là le plus important.